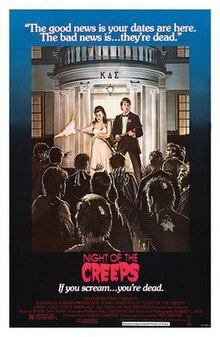 Night of the Creeps is a 1986 American science fiction horror comedy film written and directed by Fred Dekker, starring Tom Atkins, Jason Lively, Steve Marshall and Jill Whitlow. The film is an earnest attempt at a B movie and a homage to the genre. While the main plot of the film is related to zombies, the film also mixes in takes on slashers and alien invasion films. Night of the Creeps did not perform well at the box office, but it developed a cult following. In 1959, on board a spacecraft, two aliens race to keep an experiment from being released by a third member of the crew. The seemingly possessed third alien shoots the canister into space where it crashes to Earth. Nearby, a college man takes his date to a parking spot when they see a falling star and investigate. It lands in the path of an escaped criminally insane mental patient. As his date is attacked by the axe-wielding maniac, the boy finds the canister, from which a small slug-like thing jumps out and into his mouth. Twenty-seven years later in 1986, Chris Romero pines over a love lost, supported by his disabled friend J.C. During pledge week at Corman University, Chris spots a girl, Cynthia Cronenberg, and falls instantly in love. To get her attention, he decides to join a fraternity. Cynthia's boyfriend, who heads the Beta Epsilon fraternity, tasks them with stealing a cadaver from the university medical center and depositing it on the steps of a rival fraternity house. Chris and J.C. find a frozen corpse in a secret room, but when it grabs them, they flee. The thawed corpse then kills a medical student working at the lab. Detective Ray Cameron, a haunted cop, is called in to the cryogenics lab break-in, where he discovers one of the bodies – the boy who discovered the alien experiment in 1959 – is now missing, set free by Chris and J.C. The corpse makes its way back to the sorority house where he picked up his date twenty-seven years ago. There, his head splits open and releases more of the slugs. Called to the scene, Det. Cameron finds the body, interpreting the condition of the head as the result of an axe wound in the face. The next day, the fraternity brothers confront Chris and J.C., who they believe to be responsible for the previous night's incident. They are then taken in for questioning by the police. Based on the testimony of a janitor that witnessed them running out of the university medical center, "screaming like banshees," they confess to breaking in but deny moving the corpse. That night, the dead medical student rises from his slab and runs into the janitor. Cynthia attempts to convince Chris and J.C. that the attacks are zombie-related, but they are skeptical. When J.C. sees Cynthia leaning on Chris' shoulder, J.C. leaves the two alone and is attacked by the slugs that emerge from the possessed janitor. After Chris walks Cynthia back to the sorority house, he runs into Detective Cameron, who has overheard their conversation. At his house, Detective Cameron explains to Chris that the escaped lunatic's 1959 victim was his ex-girlfriend, and that he secretly hunted down and killed the axe-murderer in revenge. After Detective Cameron reveals that he buried the body under what is now the sorority house, he gets a call that the same axe-wielding lunatic has killed the house mother. Detective Cameron blows off the corpse's head with his shotgun, which releases more slugs. The next night, while everyone prepares for a formal dance, Chris finds a recorded message that J.C. posthumously left for him. J.C. says that the slugs have incubated in his brain, but he has discovered that they are susceptible to heat. Chris recruits Detective Cameron, who was in the midst of a suicide attempt, and they retrieve a flamethrower from the police armory. They arrive at the sorority house just as Cynthia breaks up with Brad, who has become possessed. After killing him, the Beta fraternity brothers show up, despite having been killed in a bus crash. Cynthia and Chris team up to destroy the outside zombies, and Detective Cameron clears the house. After they stop the horde, Chris spots more slugs racing toward the basement; Cynthia explains that a member of the sorority had received specimen brains for biology class. In the basement, they find an enormous pile of slugs, and Detective Cameron, tape across his mouth, prepping a can of gasoline. Detective Cameron begins counting down as he splashes gasoline and Chris counts down in sync with him as he and Cynthia race out of the house. As Cameron opens up the house's gas valve, several slugs leap to attack him. He flicks his lighter and the house goes up in a fiery explosion. Chris and Cynthia share a kiss as they watch the house burn. The movie ends when the dog who caused the bus accident returns and approaches Cynthia. As Cynthia bends down toward it, the dog opens its mouth and a slug jumps out toward her. Though not shown theatrically upon its original release, the original ending showed Chris and Cynthia standing in front of the burning sorority house, with the camera moving to the street where police cars race towards the burning building. The police cars race by the charred and 'zombified' Cameron who is shuffling down the street, still smoking a cigarette, when he suddenly stops and falls to the ground. His head then bursts open, with the slugs that incubated inside his brain scamper out and slither towards a nearby cemetery, suggesting the slugs have found new hosts to inhabit. Searchlights appear from the night sky, revealing the source to be the spaceship from the beginning of the film, with the aliens intending to retrieve their experiment, proposing a sequel. This original ending is on the official DVD and Blu-ray release of the film, and can be seen in some television broadcast versions of the film, via Crackle's online streaming service, some US VHS copies, and on bootleg DVD copies. Zombie Town was marketed in some regions as a sequel, being alternatively titled Night of the Creeps 2: Zombie Town in Germany. The characters' names are homages to horror directors. Director Fred Dekker originally wanted to shoot the film in black and white. He included every B movie cliche he could think of and insisted on directing the script himself. The script was written in a week. The soundtrack album, featuring Barry DeVorzon's score for the film (except tracks 22-26), was issued in 2009 by La-La Land Records. Asterisked tracks include sound effects. Night of the Creeps was released on August 22, 1986 in the United States. In the Philippines, the film was released on March 5, 1987, with free "protector" stickers handed out for early moviegoers to put on during the screening. The domestic gross was $591,366 across 70 theaters. The film was released on VHS and Laserdisc in 1986 by HBO/Cannon Video. Some of these feature the theatrical ending only. The DVD and Blu-ray was released on October 27, 2009, by Sony Pictures Home Entertainment and contain the original ending along with some special features. Rotten Tomatoes, a review aggregator, reports that 73% of 15 critics gave the film a positive review; the average rating was 6.7/10. Nina Darnton wrote that the film, though derivative, "shows a fair ability to create suspense, build tension and achieve respectable performances." Nigel Floyd of Time Out London wrote that the direction and special effects are poor, but the film is still "enjoyable enough in a ramshackle sort of way." Michael Gingold of Fangoria rated it 3.5/4 stars and called it "one of the year's most surprisingly entertaining fright features, one that homaged practically every subgenre imaginable, yet kept a sure hand on its tone and never descended into spoofery." Steve Barton of Dread Central rated it 5/5 stars and called it "a classic in every sense of the word." Christopher Monfette of IGN rated it 7/10 and wrote that the film "shows its age" but is scary, gory, and has plenty of quotable lines. Nathan Rabin of The A.V. Club rated it C+ and wrote, "Night Of The Creeps has all the ingredients of a top-notch cult movie, yet Dekker too often ends up recycling clichés rather than subverting or spoofing them." Scott Weinberg of Fearnet wrote that the film is not for everyone, but it is "horror nerd nirvana". Eric Profancik of DVD Verdict called it "a great flick that deserves its cult status". ^ a b "Night of the Creeps". Box Office Mojo. Retrieved 21 January 2014. ^ "Night of the Creeps (1986) History & Plot Summary". CultCelebrities.com. Retrieved March 10, 2019. ^ a b Gingold, Michael (3 November 2009). "NIGHT OF THE CREEPS (DVD/Blu-ray Review)". Fangoria. Archived from the original on 5 November 2009. Retrieved 21 January 2014. ^ Bussey, Ben (22 August 2011). "Thrill Me! 25 Years of 'Night of the Creeps'". Brutal as Hell. Retrieved 6 November 2014. ^ Burke-Block, Candace (4 September 1987). "Directing a 'Monster' Mash". Ocala Star-Banner. New York Times Syndicate. Retrieved 21 January 2014. ^ "NIGHT OF THE CREEPS and CHILD'S PLAY CDs and signings". Fangoria. ^ "Opens Tomorrow". The Manila Standard. 4 March 1987. p. 14. Early patrons will receive free 'Night of the Creeps' protector stickers. This must be used at all times during the performance. ^ "Night of the Creeps, DVD, This October". ShockTillYouDrop.com. ^ "Update: Night of the Creeps Happens a Week Later". ^ "Night of the Creeps (1986)". Rotten Tomatoes. Retrieved 21 January 2014. ^ Darnton, Nina (23 August 1986). "Night of the Creeps (1986)". The New York Times. Retrieved 21 January 2014. ^ Floyd, Nigel. "Night of the Creeps". Time Out London. Retrieved 21 January 2014. ^ Barton, Steve (23 October 2009). "Night of the Creeps (DVD / Blu-ray)". Dread Central. Retrieved 21 January 2014. ^ Monfette, Christopher (30 October 2009). "Night of the Creeps (Director's Cut) Blu-ray Review". IGN. Retrieved 21 January 2014. ^ Rabin, Nathan (4 November 2009). "Night Of The Creeps: Director's Cut". The A.V. Club. Retrieved 21 January 2014. ^ Weinberg, Scott (16 November 2009). "Review: 'Night of the Creeps' Blu-ray". Fearnet. Retrieved 21 January 2014. ^ Profancik, Eric (30 October 2009). "Night Of The Creeps (Blu-Ray)". DVD Verdict. Retrieved 21 January 2014. This page was last edited on 10 March 2019, at 08:52 (UTC).